Penicuik Athletic: Billy Bald, Graham Gallagher, Gary Kennedy, Matthew Lynch, Kevin Milne, Danny Kelly, Ryan Gay, Keith Barr, Johnny Harvey, Darren Moonie and Pauk Coleman. Subs: Kris Steel, Dean Walker, Graeme Cole, Darren Gray, Petr Korinek and Dougie Hope. Pumpherston Juniors: David Mathie, Lee Meekison, Craig O’Mara, Tam McQue, Andy Heeps, Jason Deans, Johnny McLeod, Darren O’Mara, Stephen Morris, Barry Wales and Gordon Adam. Subs: Billy Dunlop, Andy Whitelaw, Paul Leckie, Graham Lemar, Connor McQuaid, Lee Simpson and sub G/K Allan Pacitti. Penicuik made four changes following their defeat at Armadale with Kennedy, Milne, Moonie and Coleman returning to the starting line up. Pumpherston have started the league season very well, currently lying second in the South Division, after a poor league cup campaign. A minute’s silence was held before the start of all the day’s matches in the East Region as a mark of respect for John Patterson, the secretary of Livingston Juniors who had died earlier in the week. The East of Scotland Cup tie between Livingston and Tayport was cancelled as a result. Pumpherston’s young side with an average age of under 21 got off to a disastrous start as Penicuik came out with all guns blazing. 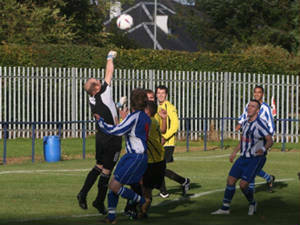 KEITH BARR netted in 31 seconds in Penicuik’s first attack. 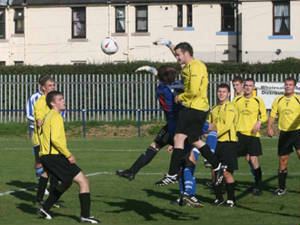 Two minutes later DARREN MOONIE added a second but had to leave the field with an ankle injury sustained as he shot home. Dean Walker was his replacement. 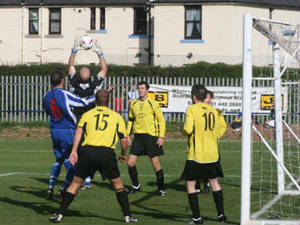 Pumpherston hit back and Lynch saved his side with a goal line clearance as Bald was beaten. 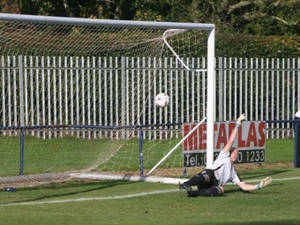 Coleman then rattled the woodwork for Penicuik with a strong drive as the game continued in an open fashion. With fourteen minutes gone the referee awarded Penicuik a penalty after a hand ball in the penalty area and RYAN GAY stepped up to put Penicuik three goals ahead. Four minutes later the game was all but over as a contest when HARVEY added a fourth. He dispossessed Deans when the ball spun away from the Livingston defender and despite loud calls that Harvey had used his hand to knock the ball forward, Penicuik’s top scorer lobbed the ball past a despairing Mathie. Pumpherston’s frustration boiled over two minutes later with Meekison leaving his ten team mates to get on with it. He saw red for using offensive, insulting and abusive language to the referee when he awarded a free kick to Penicuik after having turned down loud appeals from the visitors for a similar award seconds before. Gay looked certain to add to Penicuik’s lead in thirty five minutes when he ran onto a through pass from Harvey but could only lob tamely into a grateful Mathie’s arms. Four minutes later Harvey sent Gay through again but the ball was diverted for a corner. From Coleman’s inswinging corner Harvey’s header came off the crossbar and was cleared to safety. 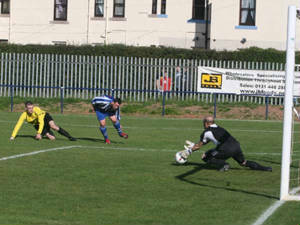 With three minutes of the half remaining another Penicuik corner was well held by Mathie. Ten man Pumpherston continued to take the fight to Penicuik and almost pulled a goal back when an enterprising run by Wales opened up the Penicuik defence but Darren O‘Mara’s shot hit the outside of the post and went out for a bye kick. 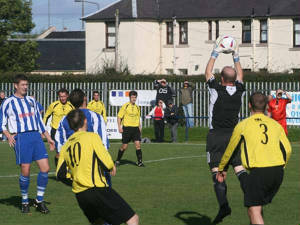 The half finished with Penicuik back on the attack. Coleman won another corner and Gay’s inswinging effort was headed off the line with Mathie beaten. Half Time: Penicuik Athletic 4 v 0 Pumpherston Juniors. The start of the second half was tame in comparison to the start of the first as Penicuik appeared to be content to pass the ball around with maybe an eye on next week’s cup tie in Edinburgh. With fifteen minutes of the half gone Walker was put clean through by Barr but dallied on the ball allowing Mathie to save the day for his side. In the sixty sixth minute Harvey was brought down on the edge of the area by substitute Leckie. Kelly’s right footed effort came back off the crossbar straight to Walker who also hit the cross bar with his header. The referee’s whistle went for offside before any-one else could take a potshot. Neat play between Barr and Harvey opened up the Pumpherston defence but Harvey’s shot passed the wrong side of the post. With obviously an eye on next week Harvey was then withdrawn to be replaced by Cole. New signing from Kinnoull, Darren Gray replaced Coleman who was having his first game after missing the last three games through injury. Cole looked certain to add to the home team’s lead in the seventy seventh minute when he was set free by Barr but he dragged his shot wide of Mathie’s left hand post. A minute later Pumpherston were reduced to nine men. Deans who had been cautioned in the first half for dissent gave away a free kick and immediately queried the award. In his frustration he kicked the ball away and was promptly shown a second yellow card for persistently infringing the laws of the game. He had to leave the field when the referee pulled out his red card. 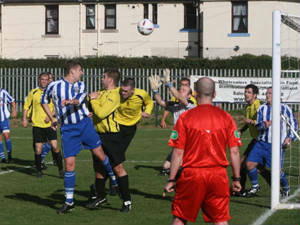 RYAN GAY scored his second and Penicuik’s fifth direct from the resulting free kick when the ball took a wicked bounce to deceive Mathie. Three minutes later GAY completed his hat trick with a left foot shot from the edge of the penalty area. Pumpherston grabbed a consolation goal with five minutes remaining. A long ball upfield caught out the Penicuik defence and substitute BILLY DUNLOP who had chased everything after he was introduced, ran through to beat Bald despite loud calls for off side. Penicuik came straight back and Cole was put through in almost identical fashion to his earlier effort and again in an almost exact copy pulled his shot wide of the left hand post. The game came to an end with Mathie making a terrific double save from Gray and then Barr when they thought they had an empty goal to aim at.